Recently, TIB has started providing its own platform to operate and present experimental services, beta versions and prototypes: TIB Labs. Our new “laboratory” allows us to offer users a peek into current research and development projects at TIB, test new and innovative technologies, and showcase future services. But why does TIB – why do libraries – need laboratories at all? When we think of laboratories, we think of facilities characterised by active research and scientific breakthroughs: the first description of nucleic acid by Friedrich Miescher, the observation of radioactivity by the Curies or Alexander Fleming’s chance discovery of penicillin. Laboratories epitomise cutting-edge research, innovation and scientific discoveries resulting from meticulous experiments and test runs. Libraries, on the other hand, are more likely to be associated with preserving our cultural heritage and providing information resources. Being infrastructural facilities, libraries fundamentally support research and science. But we rarely associate experimentation, research activities and scientific discoveries with libraries themselves. However, this perception does not do justice to modern libraries. Especially against the backdrop of the digital revolution, many libraries have turned out to be innovative and versatile players in the field of application-oriented research. By conducting their own research and development projects, libraries establish innovative services and infrastructures that support science and education. As such, libraries are helping to drive the ongoing transition to more digital, open and sustainable science. involve users at an early stage. Against this background, library labs serve as incubators for tomorrow’s library services and infrastructures. 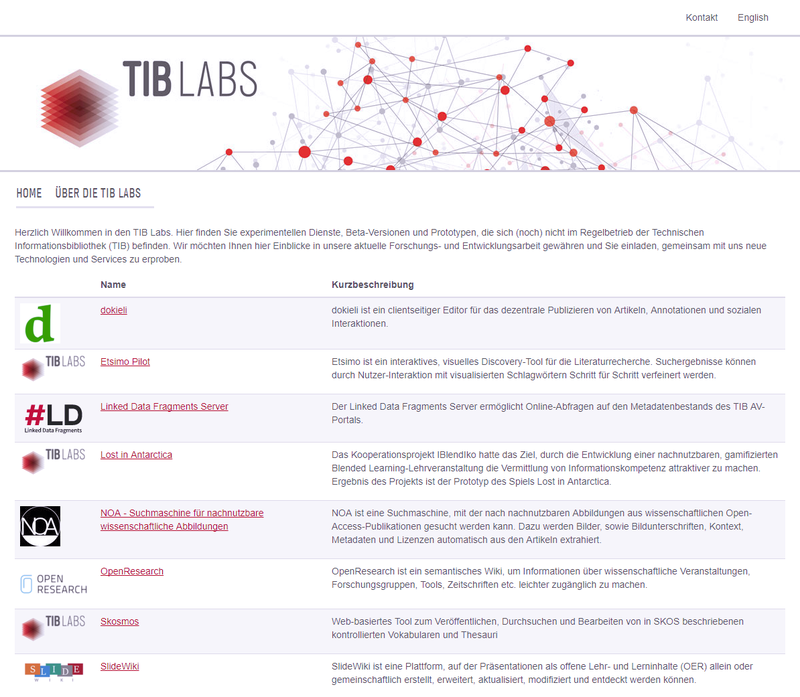 Accordingly, new services and tools currently under development at TIB can be accessed and tested at our new labs. These include projects such as SlideWiki , Skosmos and a Linked Data Fragments Server for the TIB AV-Portal’s metadata stock, which are already available for you to explore. In addition to library labs, libraries have established many other types of “laboratories” to promote research, innovation, cooperation and openness. For example, TIB has been operating the Open Science Lab since 2013, and the Lab on Non-Textual Materials since 2013. In contrast to research groups, innovative tools and services can be (further) developed, tried out and deployed on a trial basis and in an application-oriented manner. As part of a “joint lab”, TIB conducts research in the fields of data science and open knowledge together with Leibniz University Hannover and the L3S Research Centre. “Joint labs” are a cooperative model between Leibniz institutions and universities that help to provide scientific services for their members and strive to support the training of early career researchers. 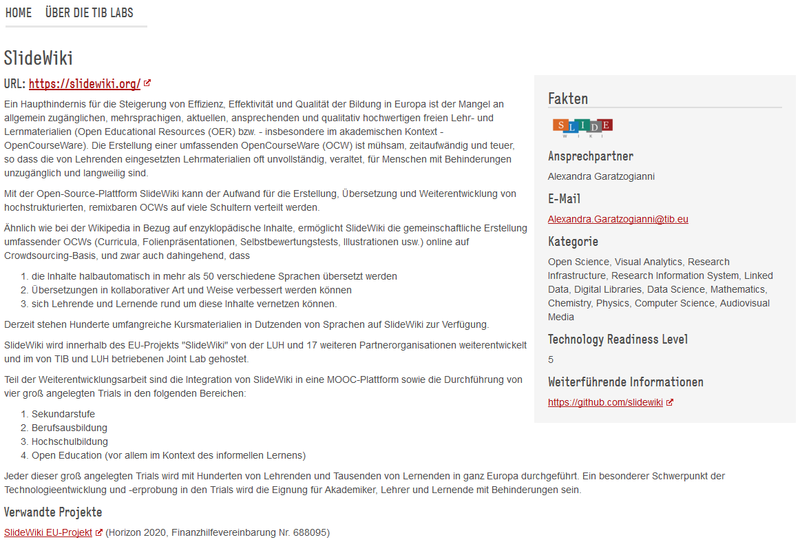 ... arbeitet im Lab nicht-textuelle Materialien und ist dort zuständig für die Themen Linked Open Data und Open AV-Portal.